DUMBARTON left Cappielow Park losers to Ladbrokes Championship third place Morton after losing in a match decided by a dodgy penalty. A crowd of 2,094 saw a very competitive encounter which will be remembered for all the wrong reasons. The game started with pace, energy, aggression and plenty of pressure from a resilient looking home side. Sons began to press back and came close when Josh Todd just failed to connect with a fierce Andy Stirling cross. Then on 19 minutes Morton went 1-0 in front. Aidan Nesbitt, on loan from Celtic, cracked the ball across goal, and it took a touch off Gregor Buchanan and went in. Minutes later Dumbarton keeper Alan Martin, having blocked a low drive by ex-Son Ross Forbes, had to be replaced by Mark Brown after suffering a back injury. With numerous close calls at the home end, Sons were a little unfortunate not to draw level by half time. After the break Mark Brown was quickly in action with a fine, diving stop to prevent 'Ton from going further ahead. The early pressure from the Greenock side was relentless. On 63 minutes Nesbitt looked to trip over his own feet when running off Darren Barr but referee John Beaton pointed to the spot amidst loud protests and Tidser converted the penalty to make it 2-0. 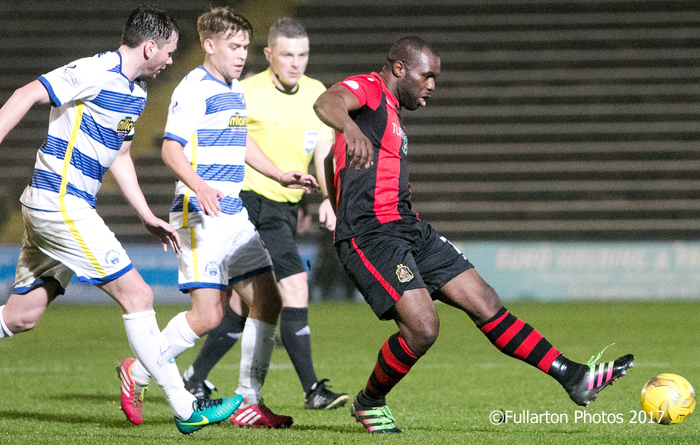 Shortly afterwards, with Christian Nade (pictured) making his second Dumbarton debut by replacing Mark Docherty, the visitors pulled a goal back. Andy Stirling did the damage, when his effort was deflected in on 66 minutes for 2-1. Dumbarton, who also fielded debutant Lewis Vaughan, on loan from Raith Rovers, as a midfield substitute, pushed hard for an equaliser in the dying minutes, but it was not to be.